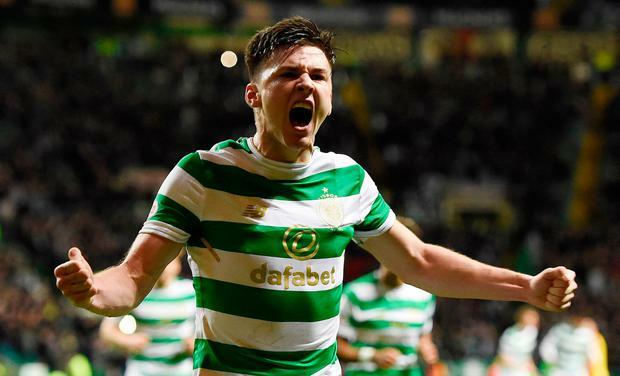 Kieran Tierney has no complaints about Celtic's punishing December schedule after sitting it out last year through injury. The 20-year-old Hoops left-back missed three months of last season between October and January after sustaining a serious ligament injury in training. Aberdeen are the visitors to Celtic Park today for the top-of-the-table clash and it will be the seventh of nine games this month for Brendan Rodgers' league leaders. However, Tierney, who scored the second goal in the 2-0 win over Partick Thistle at home on Wednesday night, is happy to be kept busy. The Scotland defender said: "Last Christmas I was out and I was gutted. "Seeing the team winning and playing well, you always want to be a part of that. "So I don't care how many games there are, it is just good to be involved. "I just want to play as many games as I can whenever I am fit and the gaffer wants me to play. "We know we have three games and then we get the chance to wind down for the week. "As the gaffer said, it has been constant for everyone for 18 months, you don't get a break with the internationals but we will look forward to three big games first." Tierney admits Celtic hit top form when they beat Aberdeen 3-0 at Pittodrie in October, when he scored the second of his three goals so far this season. He said: "That night it just clicked for us. "Our pressing and passing, it was a really good night. Aberdeen didn't do anything wrong really, we just played well." Defender Jozo Simunovic and midfielder Nir Bitton return to the Hoops squad against Aberdeen after both missed the midweek victory over Partick Thistle. Midfielder Tom Rogic is out until the new year with a knee problem and loan winger Patrick Roberts has returned to Manchester City for treatment on a hamstring injury, while Anthony Ralston remains out as he recovers from a knee problem.